Maculated Scarab, Gnorimella maculosa, Durham County, NC. This beetle flew onto a Box Elder tree adjacent to a line of ants while I was standing in a parking lot, talking to a friend. I had time for just two shots before it flew off. 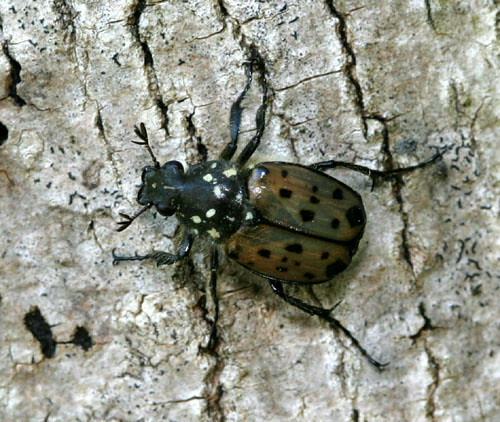 This beetle is rather uncommonly photographed--a beetle expert friend says he has never seen a published photo of a living specimen, see BugGuide. Update. There is a photo of this species in Stephen Marshall's Book, Insects--their Natural History and Diversity (2006).